This year, Christmas came early in the form of my much-anticipated order of free clothes from LadyLanguage.com, which arrived in the preceding week! Back when I was encouraging people to donate to the NieNie fund and bid in WendyB's auction, I donated money to the NieNie fund myself. Lovely Michelle, a fellow blogger and the founder of LadyLanguage.com, stepped forward and offered to match donations with double the original amount in coupons for her website. If you donate $10, you receive $20; if you donate $20, you receive $40; and so on. I can't praise Michelle enough for her charitable spirit, sweetness, and all-around awesomeness. Not only did she match my donation (even though I preceded the day her offer started by 1-2 days), she threw in a free gift with my order when a slight misunderstanding caused a delay. Plus, she took care of the details of my order personally. I was already psyched at the prospect of free clothes, but her kindness and attention to detail delighted and overwhelmed me. So, what did I order with my coupon? Scroll down to find out! Studio top. 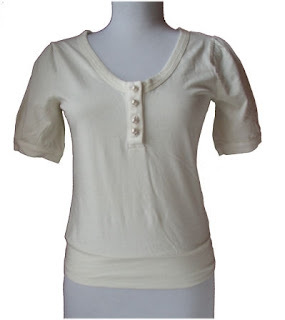 This would make a great layering piece under a vest or cardigan. 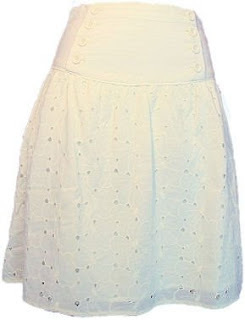 Calloway eyelet skirt. White eyelet is a perennial craving for me when spring and summer roll around, but until now I've never given in. I can't wait to wear this skirt with a tee and my gold leather Gap Kids cork wedge sandals. 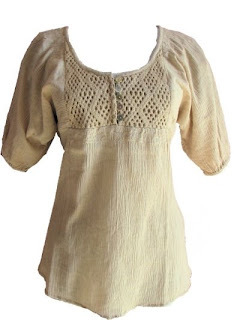 Lattice blouse. The sleeves on this blouse are puffier than pictured and didn't flatter my already broad shoulders, but I'm pretty sure I can find a friend who would love it. Deep cowl neck tunic sweater. I think that when this sweater makes its debut, I'll be pairing it with a colourful cami, pendant necklace, studded belt, dark-wash skinny jeans, and my tall boots with the brass buttons down the sides. 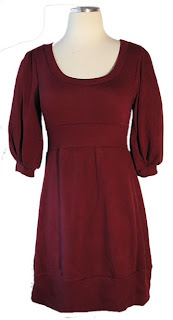 Merlot tunic sweater. You may remember me modeling this sweater as a mini-dress in my red+green post. Just so adorable. 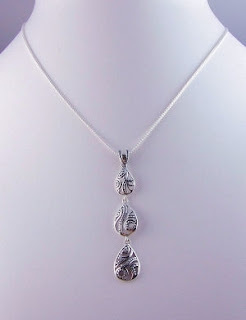 And finally, my free gift: this striking BOMA silver filigree necklace! Such lovely pieces, all. Can't wait to see them in action. Oh, these are all lovely, especially that lattice yoke. & the necklace is so pretty & modern too. What a fab idea, especially around the holidays! Love the necklace so! Wow. Lovely pieces and such a nice reward for doing the right thing. all the pieces are so nice!! yes i love the necklace!just the thing to wear on NYE! Ooo I love them all- especially the necklace! Great way to raise funds.